La Posta Publications Publisher Peter Martin has announced that in conjunction with the celebration of La Posta’s 50th year of publication, the first title in its new monograph series has been released. This is the first new La Posta monograph since the first series of 11 concluded in 1995. La Posta Monpograph Series 2 starts off with an essential reference work for students of Confederate postal history. 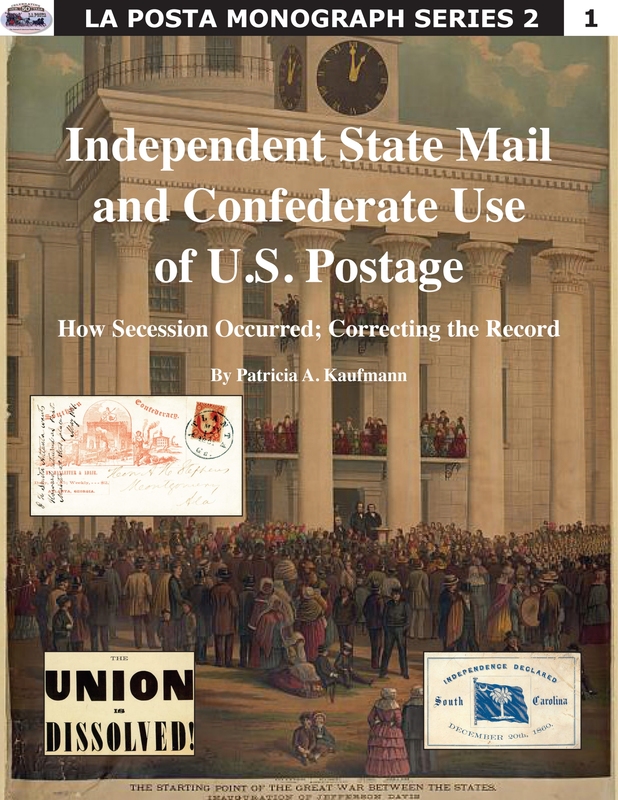 Written by Confederate philately expert and La Posta columnist Patricia A. Kaufmann Independent State Mail and Confederate Use of U.S. Postage, How Secession Occurred; Correcting the Record is groundbreaking work. Over the years, Civil War buffs have been bombarded with misinformation about the important secession dates for the Confederate states. These incorrectly stated dates bled into philatelic publications and online sources and, unfortunately, they continue to be repeated. With a systematic approach, Kaufmann researched the actual laws in place for each state at the time, while also re-examining the secession and admission processes. The results are the definitive information about secession dates with illustrations of related covers for each state. Kaufmann originally included her findings in the 2012 The Confederate States of America Catalog and Handbook of Stamps and Postal History, which she co-edited. To go a step further to explain how and why these legally accurate dates came about and why they are the true standard for serious postal historians, she wrote an article by the same title for Aspects of American Postal History, a 2017 La Posta Publications book covering 16 different aspects of American postal history. This monograph is based upon the original article with chronological and alphabetical tables, but is completely repaginated and includes greatly expanded text and images, including updates to Missouri and to the Arizona Territory listing based upon new information discovered in the October 2018 sale of the John Birkinbine II collection of Arizona and New Mexico postal history by Robert A. Siegel Auction Galleries.